Kaveri is a popular Tamil TV actress and also a heroine who acted besides Prashanth in a Tamil film ‘Vaikaasi Poranthaachchu.’ She is even a known face in Telugu TV arena because most of the serials telecasted today are Tamil to Telugu dubbed ones. In recent past, she has grown into a busy artist playing key characters in many TV serials. The sensational news in Tamil circles is Kaveri has fallen in love with a businessman Rakesh, belonging to Kerala and settled in Chennai Velacherry running a pharmacy business. 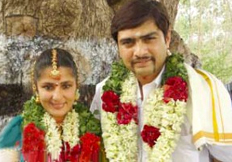 Introduced to Rakesh through common friends, Kaveri’s friendship developed into love and now they are united with a secret wedding at Artha Naareeshwara Temple, Rishi Vandiyam in Villuppuram district. Kaveri preferred a secret marriage because her family members were against the relation with Rakesh.